Summary: The Lincoln College Group has switched its aging desktop PCs and laptops for IGEL thin client devices to transform the student computing experience, improve security and slash management time and costs. Reading, UK. March 28th, 2018 – The Lincoln College Group has switched its aging desktop PCs and laptops for IGEL thin client devices to transform the student computing experience, improve security and slash management time and costs. The college group is one of the largest education, training and apprenticeship providers in the region, with around 9,000 students. The College is based over three sites, with its main campus in Lincoln City Centre and further campuses at Newark and Gainsborough. Lincoln College International also runs a highly successful female college and Riyadh Technical Trainers College in the Kingdom of Saudi Arabia. With its dispersed international sites, 4000 desktop PCs and libraries equipped with laptops for student working, the college’s small infrastructure IT team of five people was struggling to maintain its existing hardware. “There were three main challenges that drove us to look for a new approach – ageing Windows PCs and laptops, increasing security issues and the need for updates and the available resource to manage the devices,” explained Glen Harrison, IT Infrastructure Manager. So, the college began to look for a new desktop and laptop solution. It had tried a small thin client deployment in the past but that technology was now outdated. Glen wanted to revisit this option because he had seen it working very successfully in other environments. After trying thin client hardware from some of the leading manufacturers and being dissatisfied with the results, Glen and the team turned to IGEL technology, attracted by the availability of IGEL thin client hardware and its desktop conversion software. With IGEL’s UDC3 software it’s simple to repurpose existing desktop hardware bringing an end to replacing outdated hardware or patching systems with ever-changing applications. The UDC converts any x86 device, regardless of manufacturer or form factor. It takes only minutes to turn old devices into a universally deployable IGEL Linux-based thin client. Converted devices are then instantly integrated into IGEL Universal Management Suite (UMS) for remote support, zero-touch deployment and easy central management. Working with Circle IT, its trusted IT partner and an IGEL reseller, the college refreshed its IT infrastructure and created a Windows virtual environment. It has replaced its oldest PCs with new IGEL UD3 thin clients and converted a large number of the ageing Windows XP PCs and its library laptops to IGEL-like devices using the UDC3 conversion software. The backend IT system is completely Microsoft Server 2016 with a Microsoft Hyper-V 2016 platform for all the virtual servers. The thin client platform is split between thin client infrastructure servers (virtualised servers and Dell blades) and end user servers with Office 2016 installed. Microsoft App-V is used to stream the applications across the network to the devices. Using Microsoft Secure Gateway, staff and students can also enjoy the same simple computing experience wherever they log in from, using their own PC, laptop or thin client device. Students now always have the option of saving work to the college system, to their own allocated personal cloud storage or to their own device, eliminating the need for using the USB port and further eliminating security risks. The college has seen multiple benefits from the new way of working. The new thin clients are significantly less expensive to buy than new PCs and use less electricity to operate, so there are financial savings every time an old device is replaced. Lastly, the team spends much less time having to firefight and manage the devices, meaning they can spend that time more proactively, helping staff and the students at the college use technology to find smarter ways of working. Moving forward, the technology team is keen to continue to use IGEL to further increase the flexibility of its computing devices. “At the moment, we have lots of classrooms equipped with PCs and they are left unused for long periods. In the future, it would be great to replace these devices with a fewer number of IGEL converted laptops that could be moved from classroom to classroom as needed – maximising their use and cutting the number of devices required,” said Glen. IGEL delivers powerful unified endpoint management software that is revolutionary in its simplicity and purpose-built for the enterprise. The company’s world-leading software products include the IGEL OS™, Universal Desktop Converter™ (UDC), IGEL Cloud Gateway™ (ICG), IGEL UD Pocket™ (UDP) and Universal Management Suite™ (UMS). These solutions enable a more secure, manageable and cost-effective endpoint management platform across nearly any x86 device. 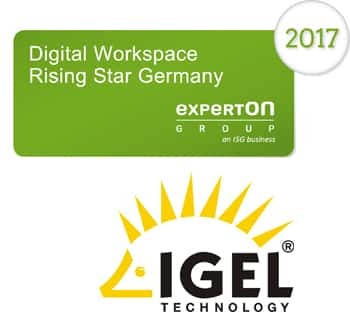 Additionally, IGEL’s German engineered and manufactured thin, zero and all-in-one client solutions deliver the industry’s best warranty (5 years), support (3 years after end of life) and management functionality. IGEL enables enterprises to precisely control all devices running IGEL OS as well as Windows OS from a single dashboard interface. IGEL has offices worldwide and is represented by partners in over 50 countries. For more information on IGEL, visitwww.igel.com.